Newlyweds Phil and Benita McCormick took the train out west to Southern California for a month-long honeymoon. One of the many places they visited was Santa Catalina Island, just off the coast. The island became a favorite place of theirs, as much for its beauty as for the memories they made during their sojourn there. Half a century later, they used this photograph, taken in the island town of Avalon, as the cover of the invitation to their golden wedding anniversary celebration. 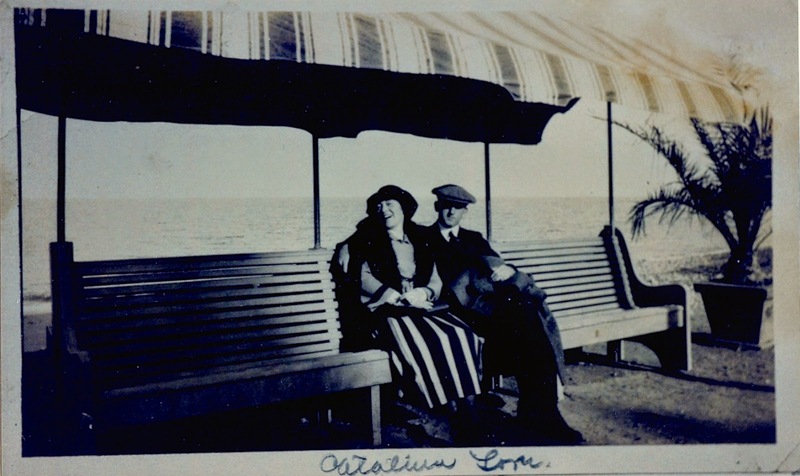 Honeymooners Benita (McGinnis) and Phillip McCormick linger on an oceanside bench in the town of Avalon, on Catalina Island, October 1921. I am shipping to you today one keg of beer and hope it reaches you in nice shape. Wish you were here. While it would be nice to learn who sent the note, it would be even more interesting to know whether the sender actually sent, or intended to send, a keg of beer across the country at the height of the Prohibition era.